A 29-year-old father of five was killed Monday night when he stopped to help a driver who ran out of gas on a Zephyrhills highway. According to the Florida Highway Patrol, the man was on a 1998 Suzuki ATV trying to tow a Ford Ranger pickup truck when a semi-truck caused the fatal accident on U.S. 301 around 10:30 p.m.
As the man moved into the left turn lane to execute a left turn onto Central Avenue, the tow strap connecting the vehicles stretched across U.S. 301. The semi traveling south on U.S. 301 then ran into the strap, causing the ATV to eject the man and overturn. The ATV driver was not wearing a helmet and suffered fatal injuries and died at the scene, according to troopers. Troopers believe the person inside the Ranger made it to the gas statio, pumped gas and drove off. The driver of the tractor-trailer, a 45-year-old St. Petersburg man, was not injured. Investigators are asking for anyone with information regarding the crash to contact the FHP at 813-631-4020. 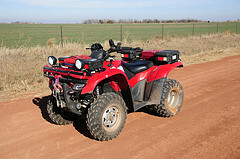 While designed for fun, ATVs are known to be quite dangerous when not handled correctly. If another driver’s carelessness, recklessness or negligence caused your injury or the death of a loved one, it is possible that you may be able to obtain financial compensation for medical bills, lost wages and other accident-related damages. To find out more, please call a Pasco County ATV Accident Injury Lawyer at Whittel & Melton at 727-847-2299. You can also contact us online to request a free consultation.